Posted: Thu Mar 14, 2019 9:40 am Post subject: Home-Made or Factory-Made Tractor?? Anyone know what this is? Was told by owners daughter that it has to be factory made that her dad bought unique ones all over the country and that he never built one from scratch. Posted: Thu Mar 14, 2019 9:47 am Post subject: Re: Home-Made or Factory-Made Tractor?? I think it is a small obscure factory made.Kind of like the 'hefty'(AllisChalmers G) type of small garden/produce tractor.Probably for a small local market.If it is 'homemade/shopmade',they did a first class job. Posted: Thu Mar 14, 2019 9:50 am Post subject: Re: Home-Made or Factory-Made Tractor?? my pants. Looks like the battery and fuel tank should be way up front for weight anyhow. Posted: Thu Mar 14, 2019 9:56 am Post subject: Re: Home-Made or Factory-Made Tractor?? Home made. Look at the engine. As new as that is if factory made you would have fenders and such because of liability issues. The battery would never be where it could come in contact with the operator either. Foot rests would be larger too. 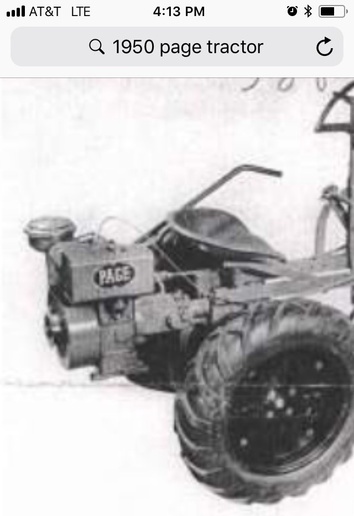 Posted: Thu Mar 14, 2019 10:22 am Post subject: Re: Home-Made or Factory-Made Tractor?? 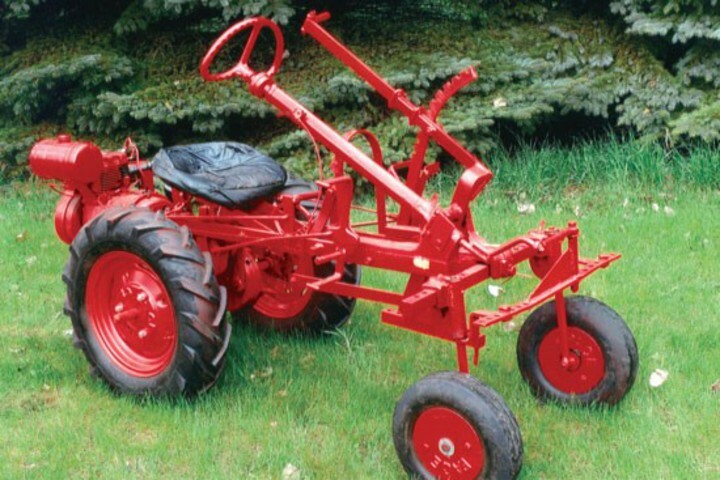 Posted: Thu Mar 14, 2019 10:57 am Post subject: Re: Home-Made or Factory-Made Tractor?? 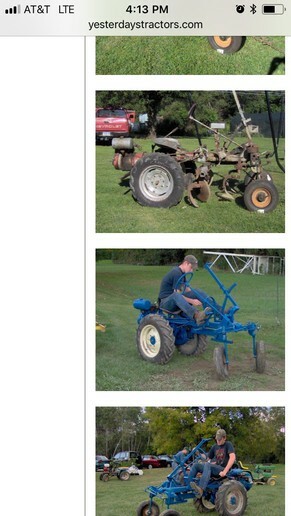 Posted: Thu Mar 14, 2019 12:15 pm Post subject: Re: Home-Made or Factory-Made Tractor?? There were alot of unique tractors made over the years. The only way to prove with 99% accuracy it's factory is to find a data plate of some kind. If it is factory there is no way of knowing if any parts or shields are missing or if the engine is original. However without being able to inspect in person and just going off the picture. I'm saying homemade. Posted: Thu Mar 14, 2019 12:16 pm Post subject: Re: Home-Made or Factory-Made Tractor?? Yes, it looks homemade to me to BUT possibly it is a low production and low budget shop/factory made one for commercial sale like you stated?? Would you happen to have a picture of one of those tractors that was built in Iowa and used in Africa? I'm sure he would have one if he could find one and this might be it. Posted: Thu Mar 14, 2019 12:17 pm Post subject: Re: Home-Made or Factory-Made Tractor?? 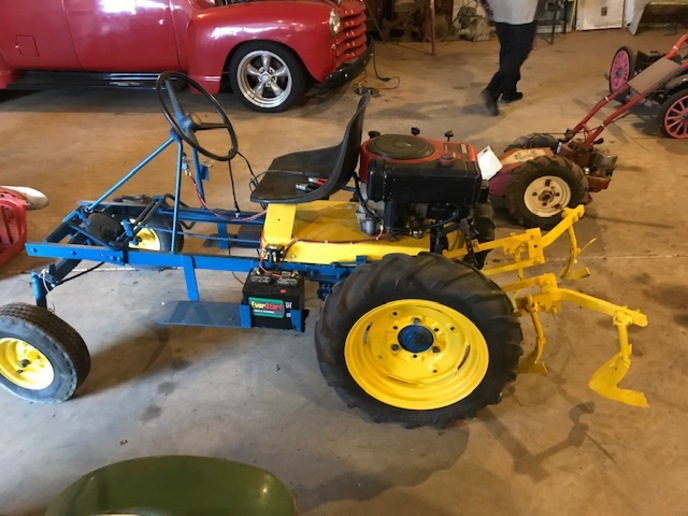 Posted: Thu Mar 14, 2019 12:18 pm Post subject: Re: Home-Made or Factory-Made Tractor?? i would guess home made due to the lack of safty features. maybe not homemade by the girls/lady's father but someone "home-made" it. 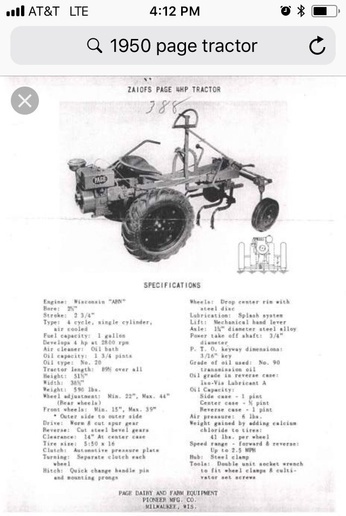 Posted: Thu Mar 14, 2019 1:59 pm Post subject: Re: Home-Made or Factory-Made Tractor?? From the archives about Self helper tractor. Do a search for Self Helper tractor Waverly Iowa and you will get some hits. CS Monitor has a good article. Posted: Thu Mar 14, 2019 3:16 pm Post subject: Re: Home-Made or Factory-Made Tractor?? (quoted from post at 18:40:45 03/14/19) Anyone know what this is? Was told by owners daughter that it has to be factory made that her dad bought unique ones all over the country and that he never built one from scratch. It looks home built to me. Probably used parts from a lawn mower salvage yard. Posted: Fri Mar 15, 2019 6:08 am Post subject: Re: Home-Made or Factory-Made Tractor?? Posted: Mon Mar 18, 2019 6:49 am Post subject: Re: Home-Made or Factory-Made Tractor?? Yeah, a friend sent pictures of these (2) different brands that look ALOT like this one. What do you all think? Posted: Mon Mar 18, 2019 7:13 am Post subject: Re: Home-Made or Factory-Made Tractor?? "ALOT" is not a word.